Symposium attendees gathered in SMC’s Soda Center. 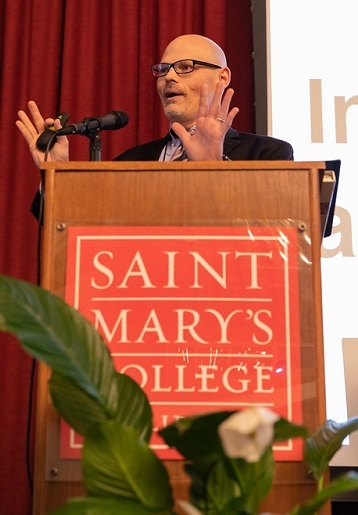 The second Bay Area Lasallian Symposium took place at Saint Mary’s College of California on February 4, 2019. 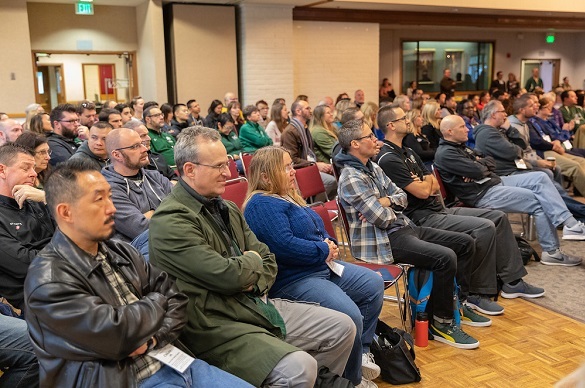 Over 470 Lasallians from nine District of San Francisco New Orleans (SFNO) schools gathered for a day of Lasallian formation, professional development, and fellowship. The participating schools included Christian Brothers High School (Sacramento), Cristo Rey De La Salle East Bay High School (Oakland), De Marillac Academy (San Francisco), De La Salle Academy (Concord), De La Salle High School (Concord), Justin-Siena High School (Napa), Sacred Heart Cathedral Preparatory (San Francisco), Saint Mary’s College of California (Moraga), and Saint Mary’s College High School (Berkeley). The first Symposium was held in 2017, the capstone project of the graduating SFNO cohort of the Brother John Johnston Institute of Contemporary Lasallian Practice. This year’s Symposium was the result of a 14-month planning process and spearheaded by the 2019 SFNO cohort. Planning Committee members were Stephanie Roybal (Christian Brothers High School), Linda Byrne and Lillian Dickson (De La Salle High School), Megan Alexander-Short and Robert Bailey (Justin-Siena High School), and Andy Chan (Sacred Heart Cathedral Preparatory). Roy Petitfils delivers the keynote. The day’s agenda began with keynote speaker Roy Petitfils, LPC. A Lasallian alumnus and therapist at Pax Renewal Center in Lafayette, Louisiana, Petitfils spoke on the role of Lasallian educators as prophets for wholeness and empowerment in the lives of today’s young people. His is a familiar voice, having addressed numerous District and Regional gatherings. The keynote was followed by Mass, which was planned by the participating schools and celebrated by Father La Salle Hallissey, OP, chaplain at De La Salle High School. The morning portion of the schedule continued with “Lasallian Learning Lab” sessions designed and facilitated by Symposium participants. The Labs covered a variety of areas, including data and institutional strategies, wellness and balance, curriculum and learning, diversity and inclusion, and co-curriculars. After lunch, participants gathered in groups according to their ministry roles for processing and best practice round table discussions. This was a highlight for many of the participants. Discussion and best-practice sharing were highlights of the day. 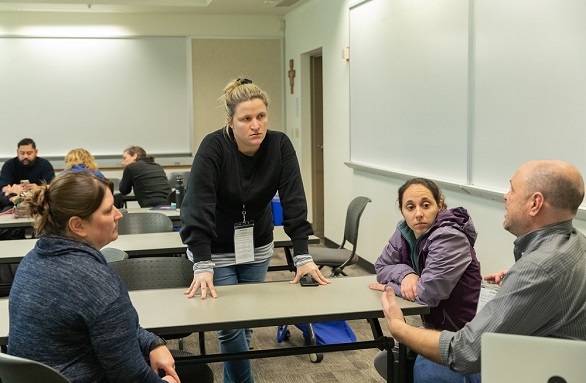 By all accounts, the Bay Area Lasallian educators left feeling that their day at the Symposium had been time well-spent, getting to move outside of familiar circles and routines and discover new opportunities for personal and professional development. Parts of this story contributed by Linda Byrne, De La Salle High School, Concord, CA. All photos courtesy Brother Lawrence Haley, FSC, De La Salle High School, Concord, CA.